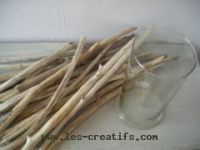 Collect pieces of wood of varying lengths, but with more or less the same diameter, in sufficient quantity to go all the way round the vase that you want to redecorate. Measure the circumference of the vase and place the pieces of wood you've chosen side-by-side together in a row until you've got enough to cover the circumference measured. You'll need a drill with a medium-sized bit as well as some thick elastic: the gray cylindrical elastic goes easily into the holes that have been drilled. 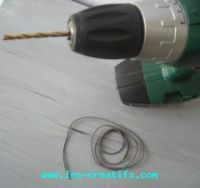 The use of elastic rather than wire means that the decorative part of the vase can be removed to facilitate cleaning. 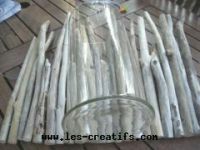 Place the pieces of wood on a flat surface, set aside 3 or 4 pieces to be added later on. The vase here has a 15 inch circumference and I've 15 inches' worth of sticks lined up in a row. I wanted the pieces of wood to be roughly the same size. 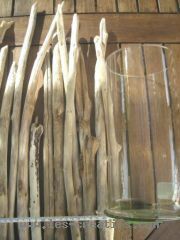 I measured out the height I wanted by setting the vase beside the sticks.I arranged the pieces so that they were a little taller than the vase. I then started to cut the sticks. Remember to keep the sticks in the order they were previously in during the cutting stage. 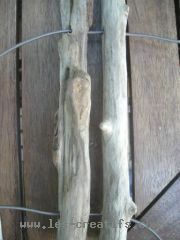 Drill two holes in every stick, at the same height in relation to the other sticks. Thread the elastic through each hole. 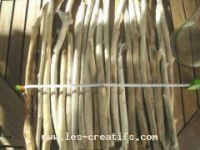 Once all the sticks have been assembled together through the two elastic threads, place the vase in the middle of the design and tie the ends of the elastic together. Before tying the elastic together, you may have to add 2 or 3 more sticks to fill any gaps. Now you can decorate your customized vase as you wish.